First up were Bridges and this was the first time I have listened to them live after catching a few songs on Spotify and YouTube. Bridges are certainly a good choice to support the Readers, their songs are well crafted with thoughtful changes of pace that keep you interested and keep on edge. I can certainly see Bridges picking up new fans as they work extremely hard to engage you. They are also hard-working as a band, staying behind to meet fans apart from the drummer who had to head back to Somerset to work as a teacher on Thursday. 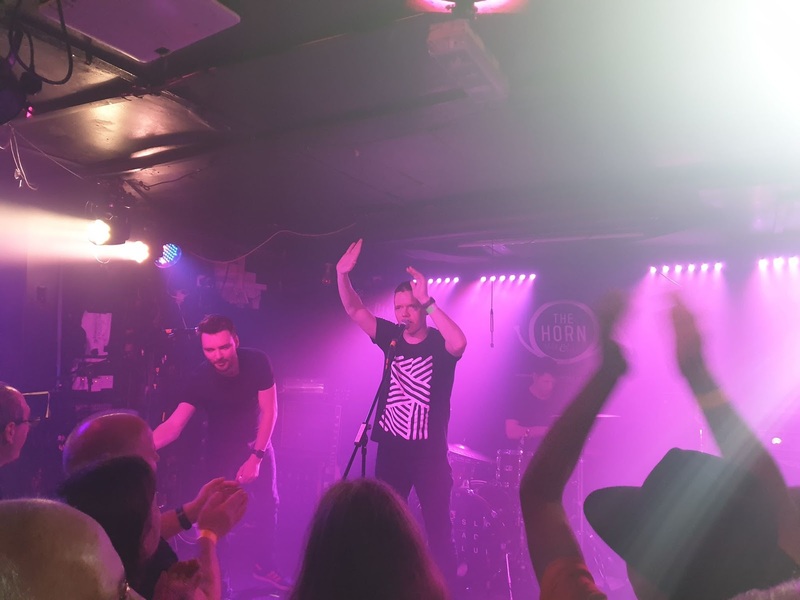 So on to the main event, The Horn is an interesting place to see The Slow Readers Club as like many places up and down the country it is a pub with a function room that has been turned in a stage at one end and a bar at the other. Seeing Ashley working his lights from a laptop at the bar gives you some indication that this is going to be intimate. As the lights dim and the sound of I Feel Love fills the room I see a few people swaying and for those in the know that means showtime is upon us. The band takes to the stage and Aaron looks out to the hundred and seventy people crammed into this room, he announces with a smile that this is going to be ‘a cosy one.’ For a band who have worked hard over years playing from pub to pub and working their way up venue ladder, I can see they are enjoying the prospect of the smallest on this tour. The opening intro of Lunatic sets people off dancing; Aaron is peering into the crowd from this first song. Start Again follows and it’s good to see fans participating in the obligatory arm-clock movement, I’m sure new fans soon picked it up. Lost Boys was next and this gave new fans the chance to hear Kurtis do the majority of the vocals and I can see the fans' approval as I look to his side of the stage. Supernatural followed after Aaron announcing it was one of their favourites and this song gives people the chance to groove and at this point it looks like Jim on bass is about to join the crowd as he is right on the edge of the tiny stage, with that Jim stare is quite famous to us Readers fans. Cavalcade gave us a chance to catch our breath but it is a beautiful song and it was good to hear a fellow fan after gig comment on Kurtis’s guitar playing it really is up there. Lives Never Known was followed by Forever in Your Debt that drew cheer from the crowd as by this point everyone was in full voice. Sirens got everyone stomping as Aaron told those who didn’t know that it was from their debut album. Through the Shadows brought the pace back down a little. You Opened Up My Heart again showed off Kurt’s guitar playing and then moving straight in Plant The Seed it took the crowd a moment to realise what the band were doing but it works so well as Aaron is interacting with crowd. 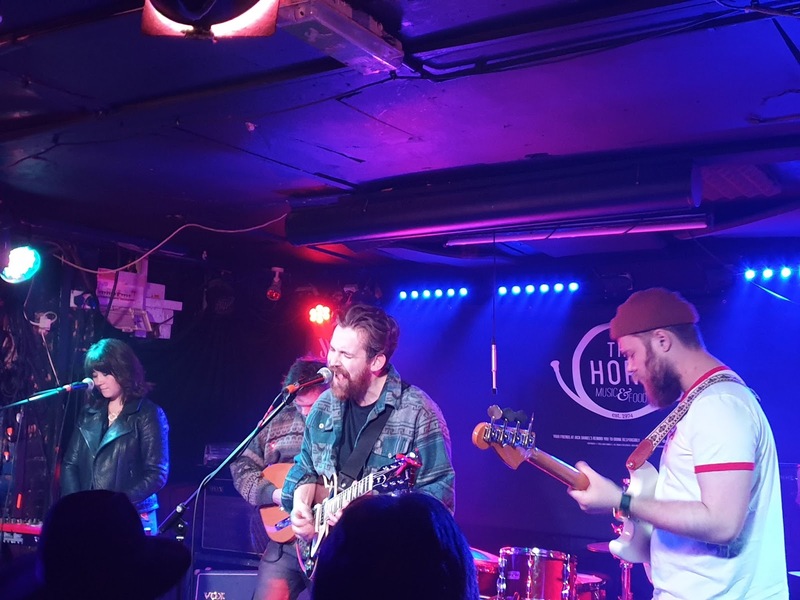 Then a treat for the crowd, Aaron says for those who don’t know this their first year being full-time musicians and they have spent January and February in the studio with six songs done for a new album. 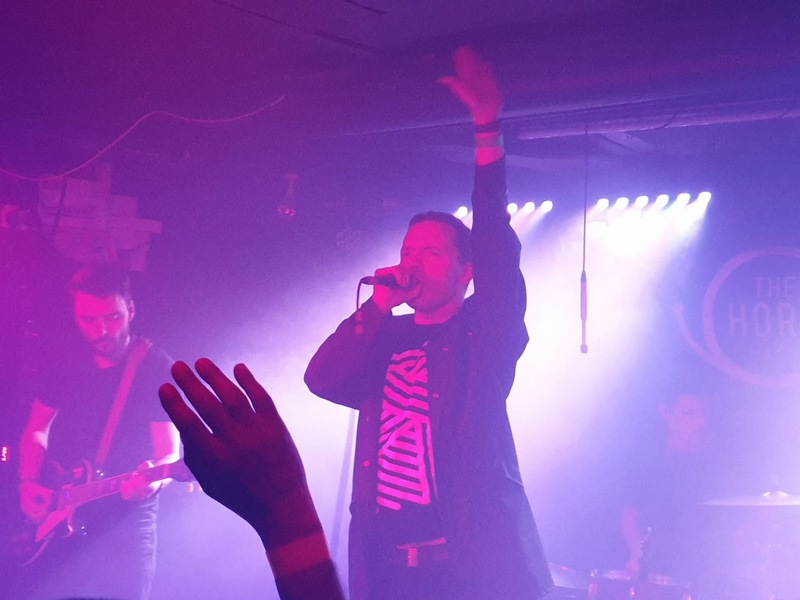 The Wait is one new song that has gone down well with crowds on this tour and it shows the band are always looking to move forward and keep themselves and the gigs fresh. Block out the Sun is an emotional song and people are well versed now in copying Aaron’s movements you just can’t but join in. With just three songs left, Feet on Fire raises the temperature and I am grateful for the big air-conditioning unit above me. I Saw A Ghost is the song that most casual followers think of when they think of the band and it gets a great reception with Jim is orchestrating the clapping. We finish with On The TV and everyone picks up riff and is happy to join in to finish the evening on a real high. Aaron said they will be back to St Albans but not sure where or when but I can probably say if they are then they will be playing to a lot more than the hundred and seventy people here tonight for sure. The Slow Readers Club's official website can be found here. They are also on Facebook and Twitter. Their massive tour continues at Norwich Open (5), Southend Chinnerys (6), Royal Tunbridge Wells Forum (8), Brighton The Haunt (9), Cologne Art Theater (23), Prague Cafe Van Lese (24), Poznan Enea Spring Break Festival (25), Berlin Bi Nuu (27), Stockholm Nalen Club (29), Oslo John Dee (30), Copenhagen Hotel Cecil (May 1), Hamburg Knust (2), Live At Leeds (4), Amsterdam Paradiso (15), Brussels AB Club (16), Zurich Papiersaal (17), Zagreb Culture Factory (18), Milan Sound Club (19), Munich Milla (20), Paris Le Club (22), Bearded Theory Festival (25), Warrington Neighbourhood Weekender (26), Madrid Mad Cool Festival (July 12) and Deer Shed Festival (26).